It is perhaps not surprising to find that clay tile usage closely correlates with areas where suitable clay is found, with clay plain tiles used to cover roofs for over 1000 years in regions including the south east of England and the Midlands. Clay roof tiles in the south-east of England feature a subtle mix of red and orange hues. Further north in Staffordshire and The Midlands, blues and browns characterise the area. The traditional colours used across the regions of the UK have become established due to the local geology of materials used. Since building materials traditionally were not transported long distances, the colour of local clays characterised the building materials of the area, such as roof tiles and bricks. 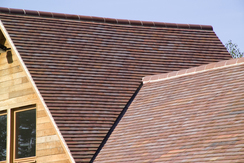 Why is roof tile colour important? Why is the colour of roof tiles so important? A combination of general design considerations and specific planning requirements dictate that the roof must blend in with the surrounding area. Regional variations in the colour of building materials across the UK mean that the choice of colour must be considered in the context of the building location. Designers and builders can take the lead from local planning departments, meaning that the specification is more likely to be granted planning permission. Recently planning trends have shown a return to more careful renovations and a need to harmonise with the existing vernacular. Clay tiles are by far the best way of achieving this because the colours are so rich and a blend of tiles can be used to authentically match surrounding roofscapes. Take our Hawkins clay plain tiles for example which have a heritage of more than 150 years. These are particularly suitable for use throughout the Midlands. The range includes several colours that have been specifically designed to match the prevailing roof colours for the region such as Staffordshire Mixture, Staffordshire Blue and Blue Smooth. The array colours and texture available throughout the clay range provide architects and developers with a huge choice when selecting the right roof tile for their project. Ultimately, in addition to its performance as a roof covering, clay tiles play a critical part in maintaining the architectural style of our towns and villages.